The 2016 San Diego Model Expo is Only 3 Days Away! Model Expo is only three days away! 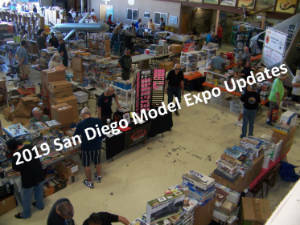 The 2016 San Diego Model Expo is hosted by IPMS San Diego and the San Diego Model Car Club in cooperation with the San Diego Air and Space Museum. The Model Expo will have both a model swap meet and a model contest. General admission to is $3. Please note – contest admission is separate from general admission. If entering the contest, paying the general admission fee of $3 is required in addition to the model contest entry fees. Contest admission is $10 for 3 entries for adults, plus $2 for each additional entry. Contest admission is $5 for 3 entries for Juniors (age 17 and under), plus $2 for each additional entry. The contest will be judged based on IPMS National rules, including the no sweeps rule, and no previous San Diego Model Expo, IPMS National, or Region 8 winners. There will also be room for display-only models – Bring anything that you’d like to show but do not want to enter in the model contest. The model contest fees do not apply to display-only models.